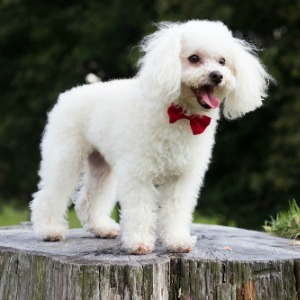 The Poodle is intelligent and active, and makes a loving family companion. Everyone knows what this breed looks like... and a lot of that is down to the distinctive hairstyle which gives it an elegant, graceful and sophisticated look. But, if you think they're empty-headed catwalk models, you'd be wrong! Under that often beautifully groomed exterior lies a lively, active personality and a highly intelligent mind. Owners who choose not to cut their dog's hair into intricate styles show off the hardy, more down-to-earth side of this breed which originated as the 'Standard' size in France (aha, that's why he's so stylish!) as a working dog - specifically used to retrieve game from bodies of water during hunting expeditions. This breed originated in France as far back as the 15th and 16th centuries. The name is derived from an old German word 'Pudel' , which translates to mean 'splashes in water'... or or 'Pudelhund' which means 'hound who splashes in water'! Grooming: The harsh, curly coat needs professional grooming every 4 to 6 weeks. May be clipped regularly. The distinctive groomed cut we now associate with this breed was actually a practical consideration. 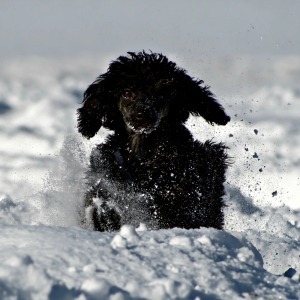 Removing areas of the tight, curly hair helped the dog to move through the water more easily, but certain regions were left insulated to protect major organs and joints from the cold European waters. The Miniature and Toy varieties developed during the 17th century and quickly became firm favorites with European royalty and the upper-classes. As their use as hunting dogs waned, Poodles found another job that they did exceedingly well and they became popular Circus dogs - due to their intelligence and trainability. They also found popularity as companions and house pets. All were recognized by the American Kennel Club in the late 1800's. Since then, this breed has had a host of host of faithful admirers and appeared consistently on the annual list of 'Most Popular Breeds'. Currently it holds the #9 position. 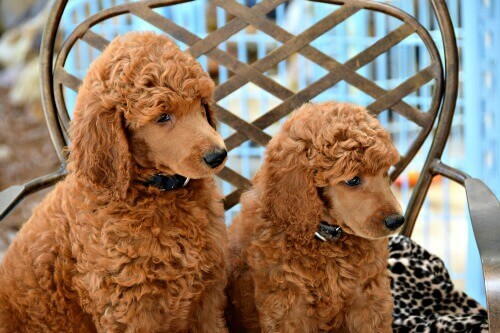 All three recognized Poodle sizes enjoy formal and competitive obedience, dog agility and conformation competition.... and they do very well in all of them! There is also a 'Teacup' size, but it is not formally recognized by the AKC. These dogs are affectionate and very loving towards their family, and are usually very good with children. They can be a bit aloof with strangers, but shouldn't be aggressive or shy. 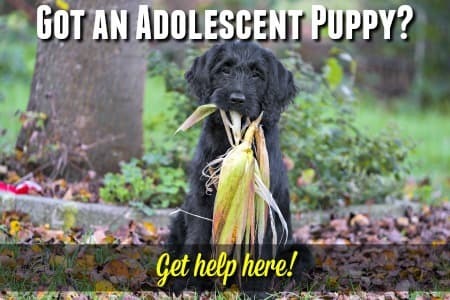 This is a very trainable breed that needs plenty of exercise and mental stimulation to keep it happy. 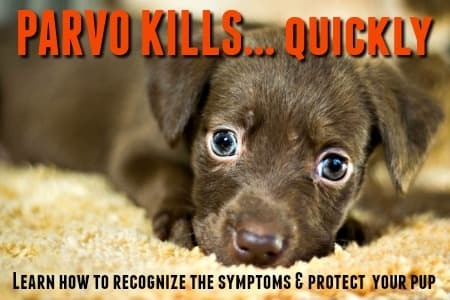 A bored or under-stimulated (or over-stimulated for that matter) dog can become hyperactive, anxious or destructive. The smaller Miniature and Toy dogs seem to be more likely to be anxious and sensitive than the Standard-sized dogs. 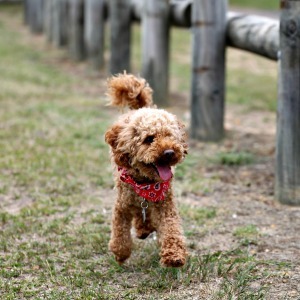 The hypoallergenic nature of this dog's strong, curly coat makes it a popular choice for those with allergies. 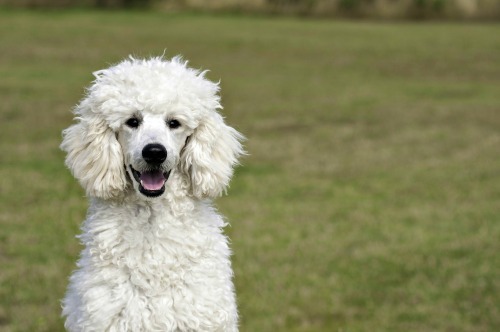 Many hypoallergenic dog breeds are a result of mixing Poodles and other breeds together.